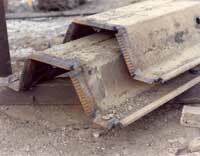 Cast steel tip protection is increasingly used for steel sheet piles. It is available in straight bars for flat and shallow-web (Larrsen and Shallow Arch sections) sheets and for cutting as needed for any “Z” configuration. For more commonly specified Z sections, (e.g. PZ-22 and PZ-27) points are readily available in one piece for quick and easy attachment. They require only intermittent welds which will hold the protector firmly in place. Although, not highly recommended, steel sheet piles have been known to be extended by welding. As of this date, a satisfactory splicer accessory for sheet piling is not known to be available.